There is a very useful article in The Telegraph on herpetiles and developers with particular reference to the situation in various places in Sussex and Kent. It is on line here. Dave Harris has had a call from a gentleman in Etchingham who has four ponds with numbers of both Smooth and Great Crested Newts, but no frogs, but would like to try. He is aware of the propensity of newts for eggs and tadpoles of frogs, and will segregate same from them. So basically, does anyone know of surplus frog tadpoles? He is willing to collect and pay a donation to SARG. Might be interesting, though, to have a look at his ponds and GCNs too. His name is John Atkins, and telephone number is 01435 883551. There is an interesting article about this here. Maybe we could encourage Sussex, East and West, to set up Community Heritage Initiatives for recording reptiles and amphibians. Interesting to see too that Rutland is supporting Leicestershire. Maybe we could get Surrey to help us. I am organising a River Festival on Lewes Railway Land Local Nature Reserve, on the 30th June 2007, and I am ringing/writing round lots of people I think may like to take part - or suggest someone who would. The event will be a family community event celebrating the nature reserve and the Ouse river valley. There will be workshops and activities, such as willow weaving, performance including dance by local schools children, music by a local band, and lots of stands for community groups to either run activities or advertise their existence/products/services. We are trying to invite many wildlife organisations so that their presence can help raise the profile of wildlife protection and the importance of local nature reserves. 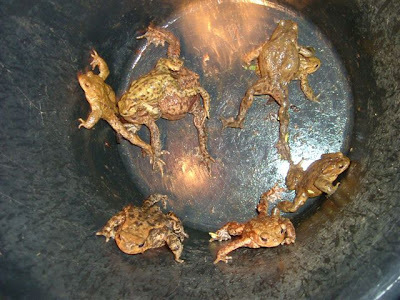 The toads head back to their traditional breeding pools after dark and need help so that they do not get run over. The picture shows some of the lucky ones being taken over in a bucket.